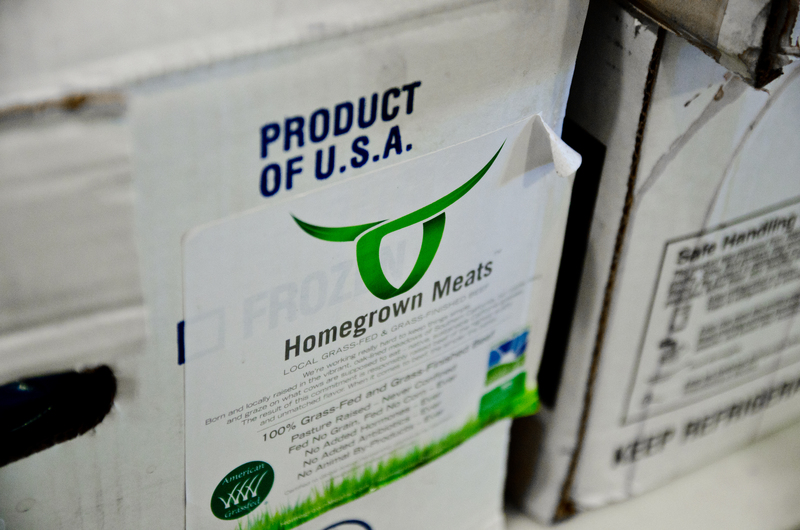 Home Grown Meats’ mission is to deliver the best and highest quality meats to the consumer. By partnering with local farmers and ranchers, they are able to pursue and fulfill this vision. 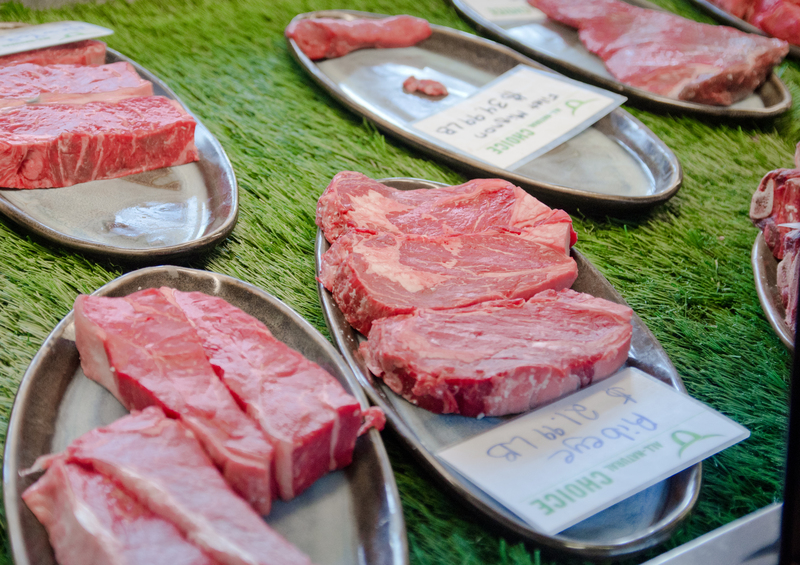 Furthermore, concurrent to high quality is the fact that all the meats carried here are hormone-free and antibiotic-free. In this traditional butcher shop dwells poultry, pork, beef homemade sausages, hot dogs, bacon, beef jerky, venison, wild boar and cheese as well. 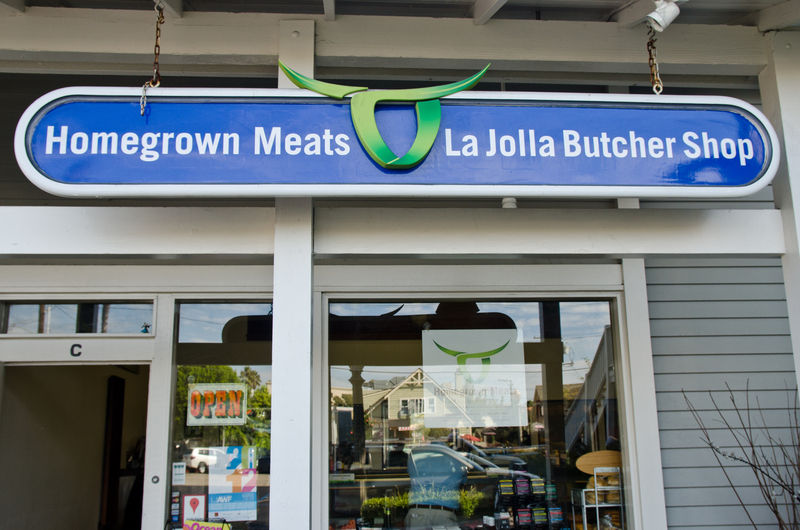 On top of this holistic offering, La Jolla Butcher shop offers custom cuts and dry-aged meats. 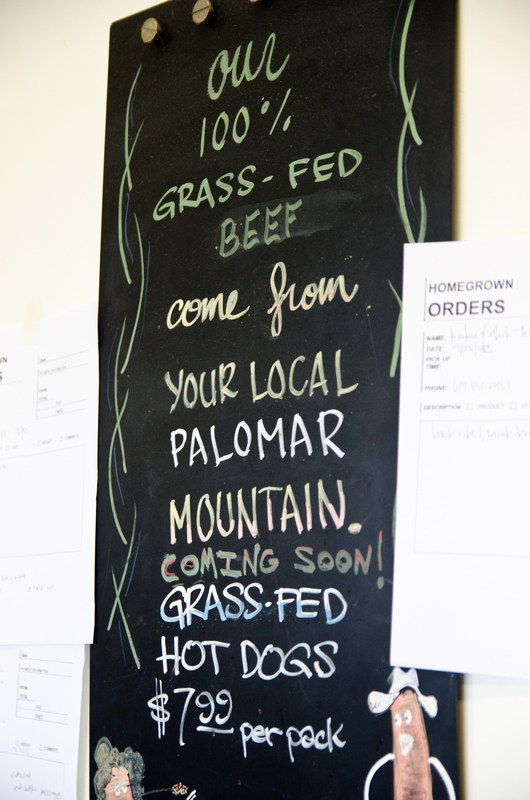 Lastly, this butcher shop is famous for its specialty seen below: Homegrown Meats. The first thing you will notice is how homey this shop is. 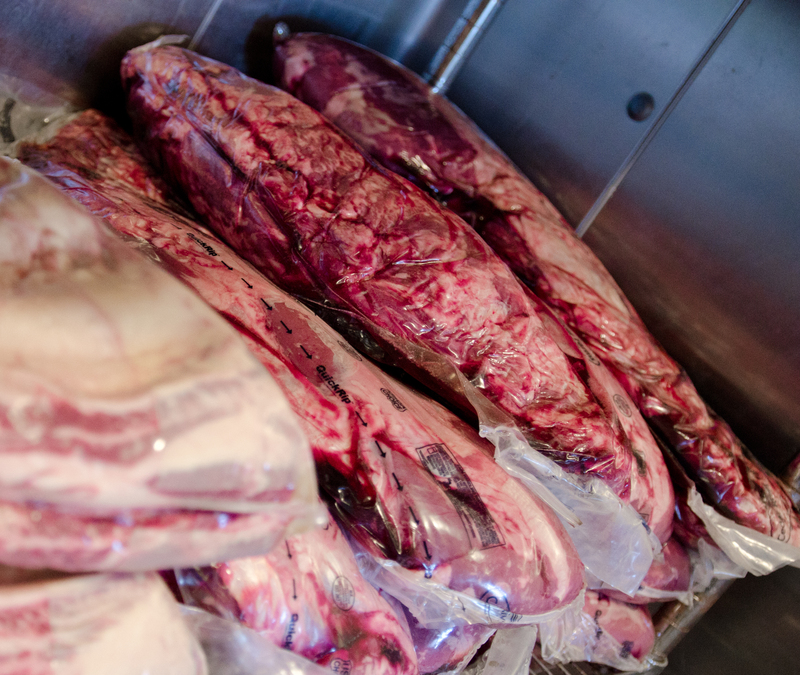 In the front of the store are two refrigerated display refrigerated cases in the front of the shop; the left contains beef (choice, prime cuts, grass-fed and grass-finished) and the right contains their non-beef offerings (bacon, house-made sausages, chicken, wild pork, cheese). Before you could implore further, your concentration is politely interrupted by a greeting and smile from one of the four butchers (Max, Eric, Tyler, and Jessie). Pictured below to the left is Eric and on his right is Max. During the conversation, your peripherals shift your gaze skywards in front and to the right. Meeting your eyes are the trophy heads of Pronghorn antelope from northeastern California, a wild hog, Kansas white-tailed deer, and a moose. 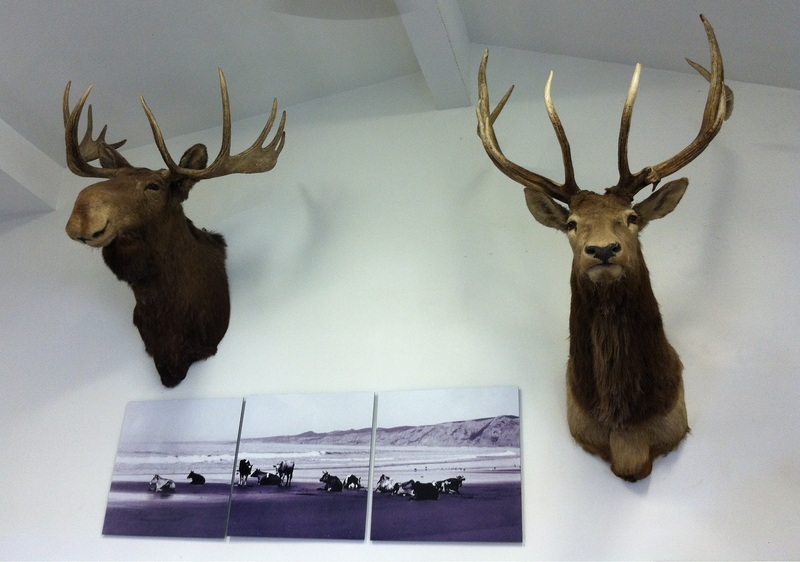 These are taxidermy, in which some were hunted by two of the owners, Matt Rimel and Peter Morris. The other partners consist of Thad Benshoof, and Dan Snyder. 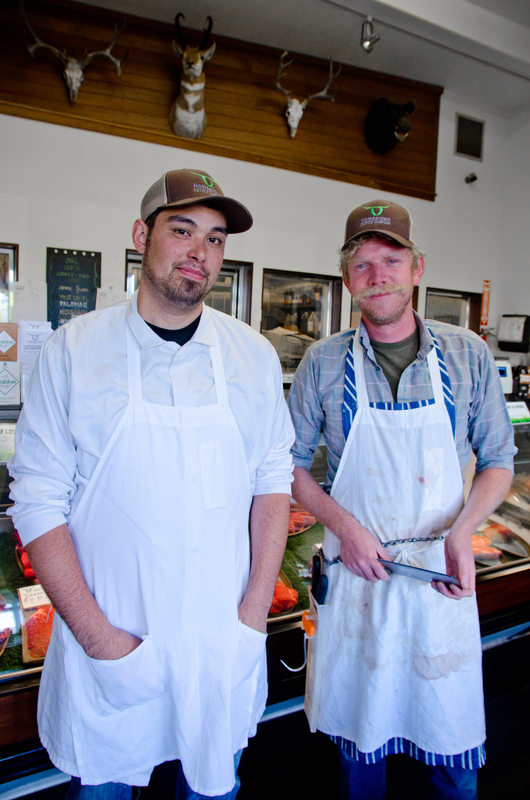 This butcher shop has now been open for a little bit over 4 years (started in August of 2008). 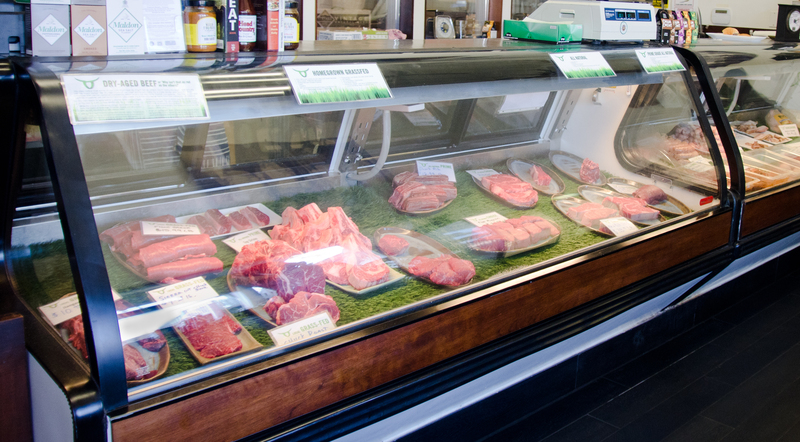 Behind the display cases are counters where the butchers work on customizing the meat. They use a variety of knives shown here, with Kevlar gloves as well. We were able to witness the preparation of skirt steak and filet mignon. 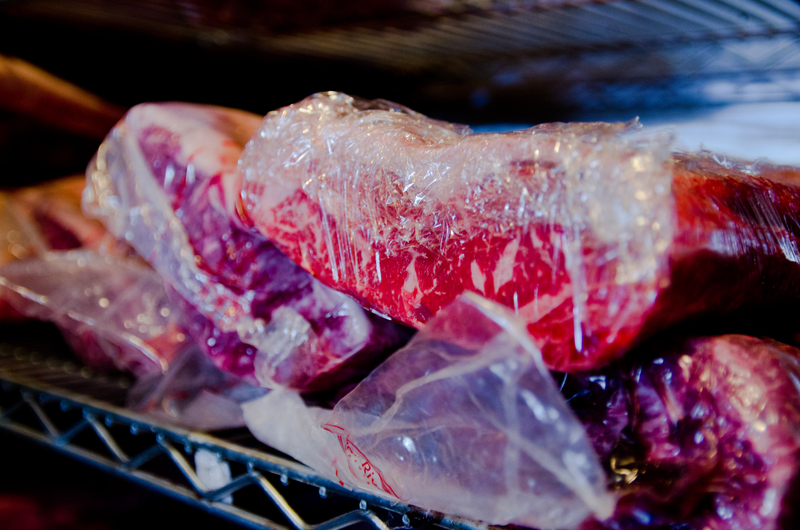 This process includes removing the meats from the vacuum sealed packages that they arrive in, to removing the silver skin, and the fat, and cutting and slicing of the meat. 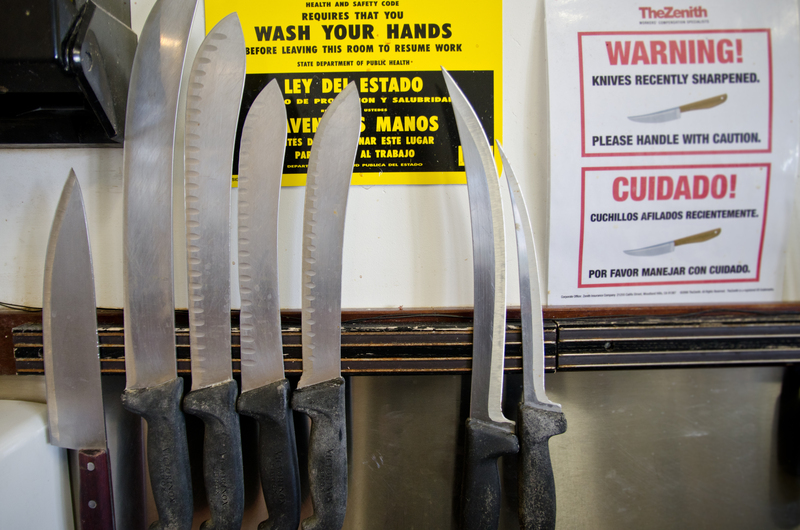 The fat removal process is intricate to the point where a knife by itself will not suffice, the butchers had to dig in with their fingers and hands. Beyond the display cases, counters, and table tops, is the cold room, which is about half the size of the butcher shop. The cold room is divided into two sections. A third of the space to the left is taken up by a dry aged cooler, which as the name indicates, is where dry aging takes place. There are also steel shelves to store meat here. The cold room is divided into two sections. A third of the space to the left is taken up by a dry aged cooler, which as the name indicates, is where dry aging takes place. There are also steel shelves to store meat here. 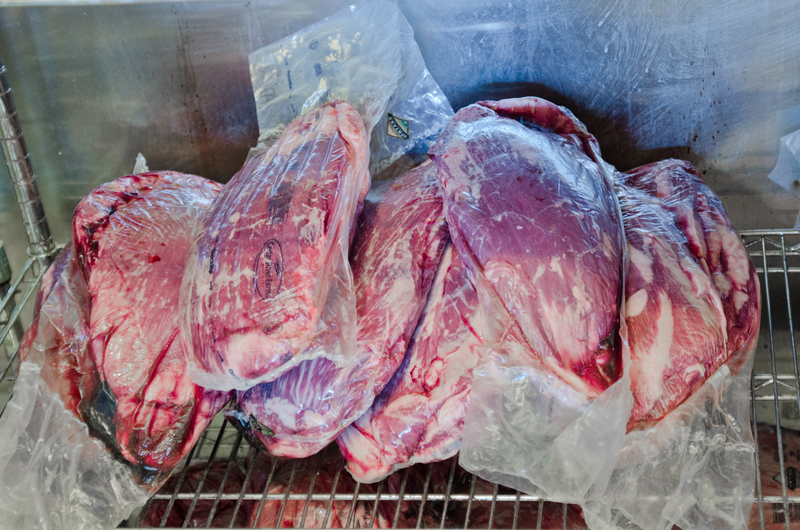 We witnessed venison, rib eye, and a beef round dry aging. The far right meat is a beef round, while the three to the left are venison. The remaining two thirds of the cold room is used to store the inventory of meats. In the back rightmost corner is a band saw, which is used to cut huge sections of meat. 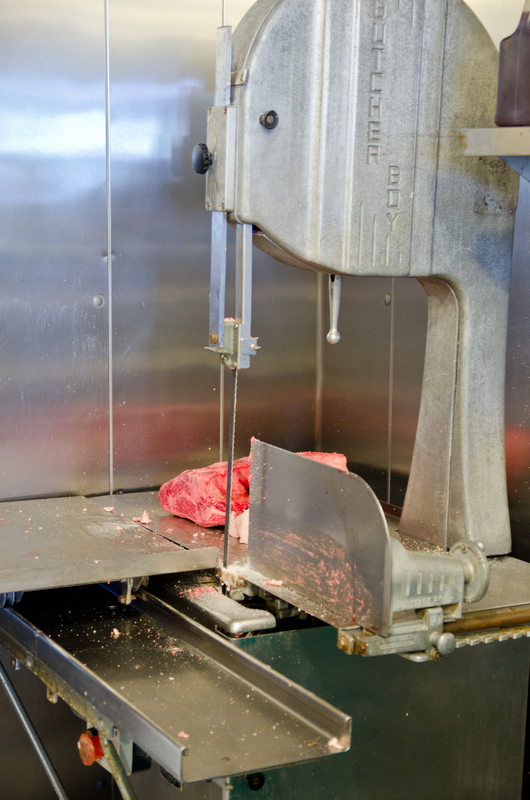 This area is also occupied by a band saw (used to cut huge sections of meat) and a meat grinder (used to make ground beef). Open for a little bit over four years now, the feel you get from this shop is definitely more homey. The homeyness comes from a mixture of the size of this operation, the local vibe, and also a serene feeling that you get when stepping inside. Non-existent is the rush and noisiness from the regular grocery store. 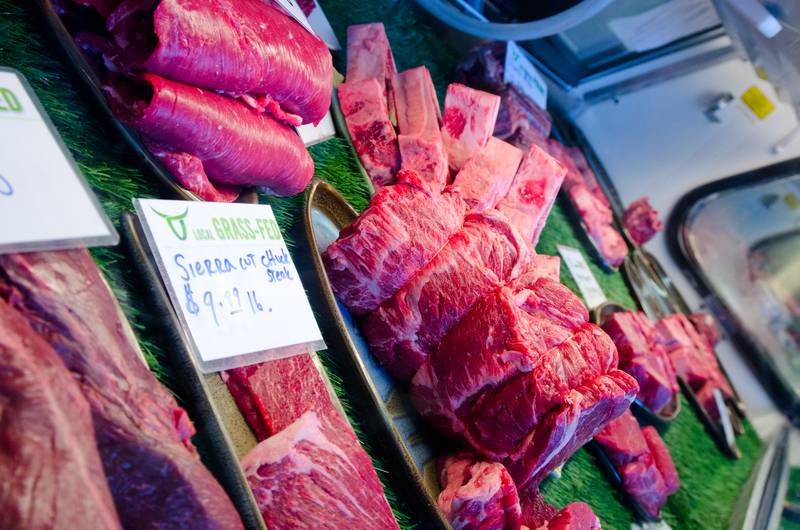 Since foot traffic is harder to determine than your typical retail supermarket and because the meat is the best and highest quality, there is a chance what you are looking for is completely out. 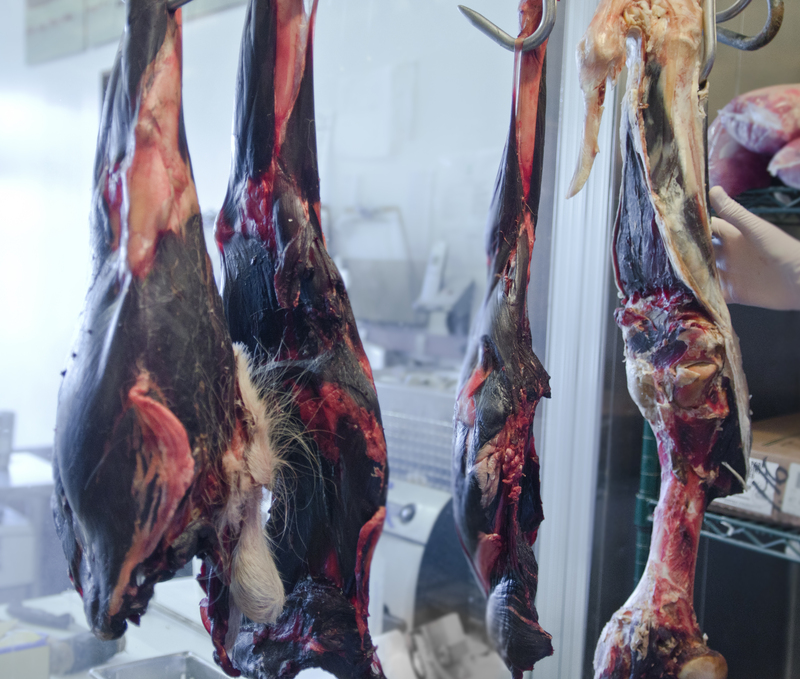 The meat is not colored but since demand meets supply, the meat seen here is never brown, nor brownish-reddish. Sunday’s are especially high traffic days. However, if you do not see it in the display case, do inquire because they might have it packaged in the back, in which the butcher will happily prepare for you. “We’re committed to providing products that are healthy, environmentally sensible, humane and incredibly tasty.” They certainly have lived up to that statement. 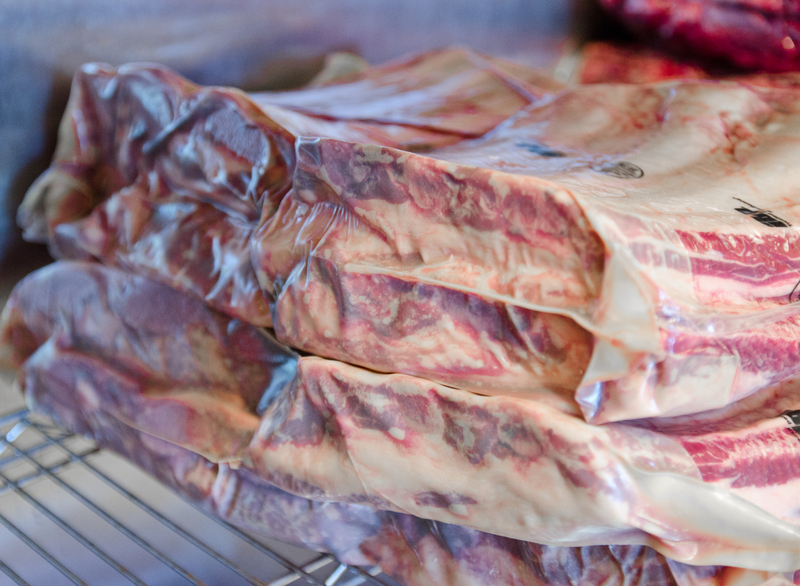 What is your experience with grass-fed and grass-finished beef before? Are you able to tell the difference between that and regular-commercialized beef? Place your comments below. Coming up, as the sign says below, a sneak peak!